Code RGV set up a communication hotspot in Rockport to help survivors of the hurricane. Rene Ramirez and Drew Lentz left McAllen for Rockport Thursday morning in an RV, but unlike most volunteers heading to the town that faced some of the worst destruction from Hurricane Harvey, they weren’t bringing packages of food and water for residents. Their vehicle was loaded with MacBook Pros, routers, phones and hardware needed to restore internet and phone services, which were knocked out Aug. 25 when the Category 4 hurricane made landfall along the Texas Gulf Coast. Ramirez and Lentz are the founders of Code RGV, a nonprofit that promotes technology innovation and entrepreneurship in the Rio Grande Valley. They typically offer educational programming but realized their retro-fitted RV — which functions as Code RGV’s Classroom on Wheels — could fill a vital communication gap in a town trying to get back on its feet. Rockport, a coastal town of 10,000 located 30 miles northeast of Corpus Christi, was hammered by Harvey’s eyewall, which holds the storm’s strongest winds. After initial plans to connect fell through Thursday evening, the team was approached by a representative from Rockport WiFi, who happened to see their tower. He ultimately helped them connect to their network and create a communication hotspot. Ramirez and Lentz wanted to create a sense of community around Code RGV’s RV, which they set up at the corner of an H-E-B, right across the street from a donation drop-off point. “ It was kind of ground zero for everything,” Lentz said. Most people used the resource to plug in their electronics, or just to take a break from the heat. The team saw people break down in tears from the return of a cell signal, and a man who was ecstatic to regain access to pictures of his grandchildren he had stored on his cellphone. “It can be the smallest things that you don’t think about that makes all the difference in the world,” Lentz said. Another woman couldn’t get in touch with anyone in her family until a quick social media post changed that. One woman in particular stuck out in his mind. Brandy approached the Code RGV team carrying a small bag with everything she was able to save. When Lentz asked her how he could help, she broke down because she had lost her dogs in the storm. She stayed at the hotspot for hours, using their phone to try to locate them. When Brandy left, Lentz wasn’t sure what would happen. But within a few hours, Brandy returned, dogs in hand. She later was able to find her truck, which was impounded. “It’s really humbling,” he said of the overall experience. The bulk of the team’s work consisted of providing a way for Rockport residents to apply for Texas Workforce Commission disaster unemployment assistance or Federal Emergency Management Agency relief. They set up an efax account early on after they realizing applicants needed to fax information to FEMA, who Lentz said only arrived in Rockport Saturday to start processing claims. National Guard members also used their services to communicate and coordinate with central command, telling the team they hadn’t seen this resource provided after other natural disasters. “I’m so glad we were able to hit that niche,” Ramirez said. Rio Grande Valley residents were eager to help Code RGV’s efforts, even if they couldn’t make it to Rockport. Weslaco’s GCR Tires donated six new tires, with a warranty and roadside assistance for the journey, and individual donations have come flooding in. He encourages people to think about ways to give back to Harvey-affected areas using their skill set. And that, it turned out, was something most needed. 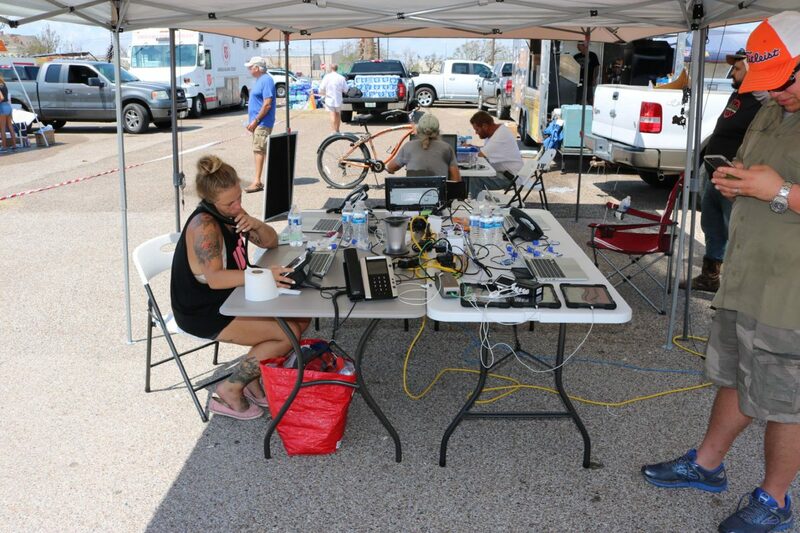 Saturday afternoon as the team prepared to head back to McAllen, residents were still approaching the RV’s window to fax information, charge electronics and make one last phone call.